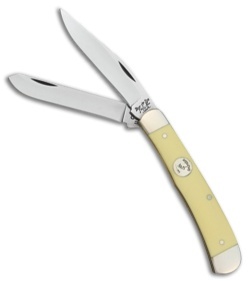 This Bear and Son 4th Generation Series Trapper features clip and spey blades made from 1095 stainless steel. Yellow delrin handles with nickel silver bolsters, brass liners, and a 4th generation inlay shield. Upgrade your collection today with the Bear and Son 4th Generation Series Trapper pocket knife.